COMPTIA SECURITY+ SY0-401 IN DEPTH will prepare you to pass CompTIA’s new Security+ certification exam and earn this important credential in the field of computer security. This book offers in-depth coverage of all relevant topics, from handling malware to advanced cryptography, wireless and mobile security, and much more. Using the proven In Depth certification training method, this comprehensive, up-to-date, user-friendly test-prep guide covers exam objectives for the new Security+ SY0-401 certification exam; features end-of-chapter quizzes to test your mastery of each new skill you’re learning; maps completely to the Security+ SY0-401 exam objectives; and includes a full glossary and helpful appendixes. Computer and network security is a crucially important and ever-growing field, and IT professionals must keep up with the latest challenges and technologies. The CompTIA Security+ SY0-401 certification exam validates the knowledge and best practices required of professionals responsible for securing computer networks and managing risk. 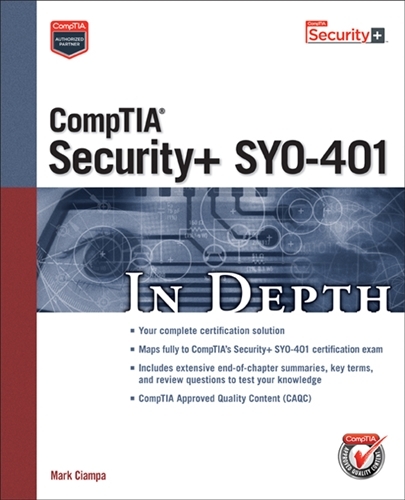 The coaching and test-prep resources contained in COMPTIA SECURITY+ SY0-401 IN DEPTH will give you the skills and confidence you’ll need to succeed on exam day.